Samsung's Galaxy Note 8 features a first for the company: dual camera lenses. The headline feature is Live Focus, a simulated depth of field mode. 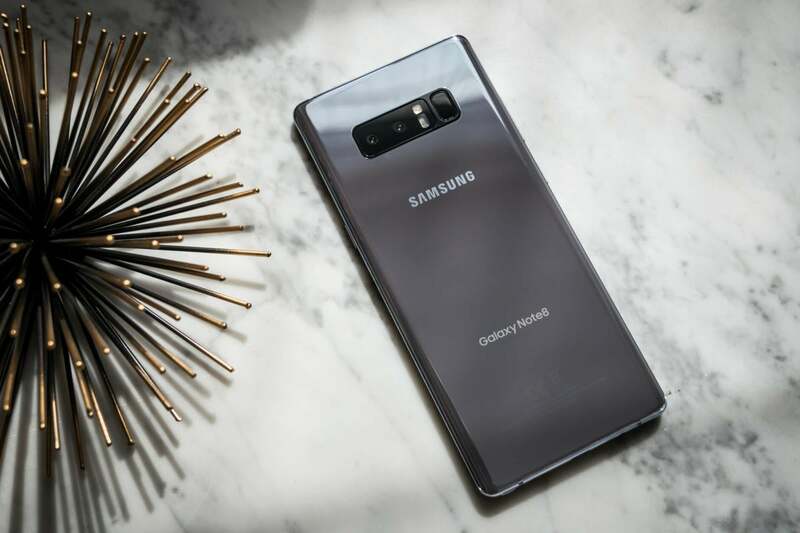 Samsung’s Galaxy Note8 has finally been revealed, and if you have any interest in photography at all, you’ll be focused on the phone’s new dual-camera system. This is a first for Samsung, which has previously stuck with a single camera while its competitors—Apple and LG, to name just two—have gone the dual route. While LG uses a second camera for wide-angle photos, Samsung is using its second sensor for a depth-of-field mode it’s dubbed Live Focus. I got some hands-on time with the Note8 during a pre-briefing, and I’m convinced this is a huge upgrade for Samsung’s photography fans. The Galaxy Note8 houses two 12 megapixel cameras almost flush with the glass back. The hardware is made up of two separate systems. The main camera has been dubbed “wide,” but is really just a traditional normal lens like on other Samsung phones. The second camera is the “telephoto” option, affording 2x optical zoom over the wide. Both cameras boast 12-megapixel sensors with the same Dual Pixel technology found in the Galaxy S8 and S8+ from earlier this year. The wide lens has an aperture of f/1.7, while the telephoto goes with a slower f/2.4. This means the telephoto lens needs more light than the wide lens in order to achieve the same exposure. 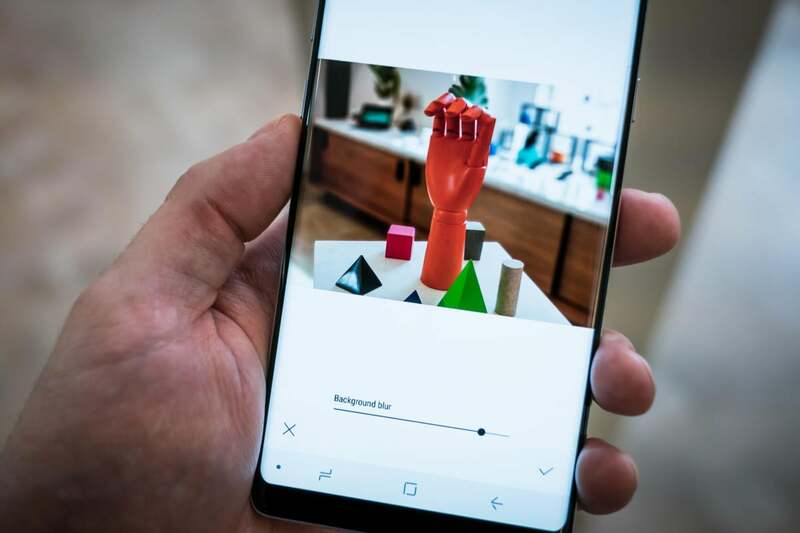 In a first for smartphones, Samsung has added optical image stabilization (OIS) to the telephoto lens of the Note8. Almost every smartphone has some form of OIS on its main camera, but none of the second cameras have had this—until now. Optical image stabilization is a relatively advanced hardware feature wherein the camera’s lens assembly is integrated with a gyro motor. As your shaking hand struggles to maintain focus on an object, the gyro compensates for this motion, and keeps a lock on whatever you’re about to shoot. No one has a perfectly steady grip, so OIS is there to give the camera more time to leave its shutter open, resulting in a cleaner, less blurry image. Samsung Note8's Live Focus feature allows you to adjust the depth of field effect in real time before you shoot. Dual smartphone cameras are as trendy as ever in 2017, and almost every manufacturer has at least one dual-camera phone in its line-up. For two generations, LG has used the second camera as a true wide-angle lens—it has an almost fish eye view of the world, and lets you capture a more panoramic shot than you would with a traditional lens. Huawei takes a different approach, dedicating a second monochrome camera to gather fine details. Huawei’s software then melds this monochrome shot with the RGB image from the main camera, and the result is an overall better photo, especially in shadows and highlights. Samsung has opted for a much more common route, using the second lens as a telephone (or zoomed-in) option. This is the same approach we see in Apple’s iPhone 7 Plus, and allows the Note8 to dip its toe into the world of depth-of-field effects. But where Apple calls this Portrait Mode, Samsung has dubbed these background-blurring bokeh tricks Live Focus. 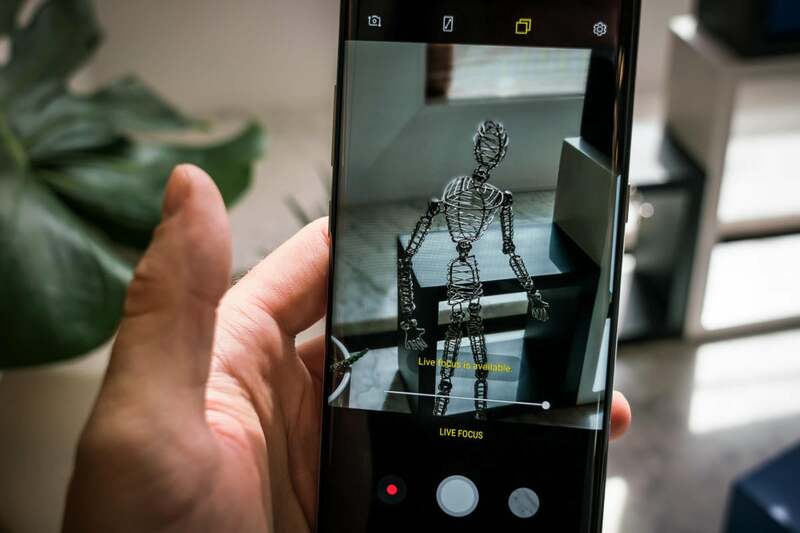 By using two cameras, the Note8 is able to model a three-dimensional space, and then use software to introduce artificial blur around the focus point. The camera app includes a handy slider that allows you to adjust—in real time—how much background blur will be present in your final shot. The iPhone 7 Plus doesn’t have this level of control, so Samsung has an exclusive on this trick. For now, at least. We’ll have to see what Apple has in store for the iPhone 7s and iPhone 8. Samsung Note8 Live Focus feature allows you to adjust the depth of field effect after the shot is taken. Open the Note8’s gallery app, and you’ll have access to the same depth slider in all photos shot with Live Focus turned on. From there, you can save a new image with a different amount of blur in it. This is possible because all of the information captured by the second camera remains intact. The post-production slider feature isn’t entirely new, and I actually prefer Huawei’s method of giving you an F-stop number to adjust for easy reference. But in my brief time with Live Focus mode, it worked well. It’s a brand new processing technology, so it’ll probably take a while for users to figure out how they can use it best. It’s impossible to determine a camera’s true quality without studying the pixels of full-resolution photos downloaded to a desktop PC. So please stay tuned for our comprehensive camera tests once we have the Galaxy Note8. We’ll be shooting both in the studio and out in the field.